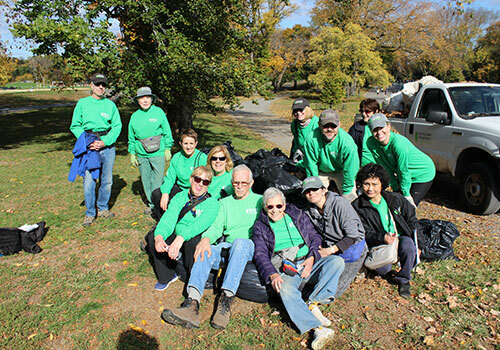 Come help keep Central Park clean, green, and beautiful by joining one of our four Seasonal Teams. Weeding Team: In spring and summer, help us maintain Park landscapes by removing unwanted and invasive plants. Paint Team: In spring and summer, help us paint fencing, railing, and more than 9,000 iconic benches located throughout the Park. Raking Team: In autumn, help us rake the leaves that fall from the Park’s 20,000 trees. Snow Team: In winter, help us clear away snow from the Park’s 21 playgrounds, so neighborhood children can enjoy them safely. Everything needed to complete seasonal projects is included. For your convenience and safety, please wear long pants and closed-toe shoes. No experience is necessary. On-site training is provided, but individuals must be 18 years or older. New Applicants: Please click here to fill out a Central Park Conservancy Application, indicating your interest in the Seasonal Teams. NOTE: If you have previously created an online volunteer profile, please do not create a new one. If you do not remember your login information, contact the Volunteer Department at volunteer@centralparknyc.org.